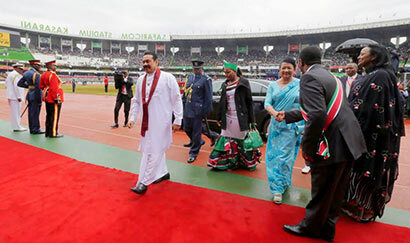 Sri Lanka President Mahinda Rajapaksa and First Lady Shiranthi Rajapaksa have joined the Kenya’s golden jubilee independence ceremony on the outskirts of the Capital City, Nairobi on 12 December. 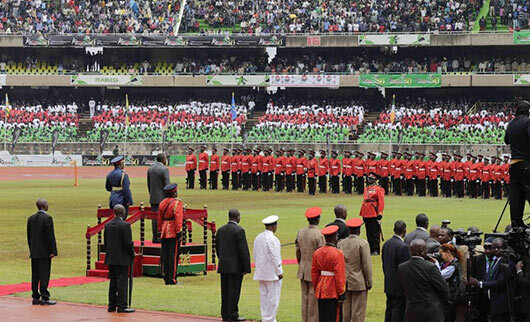 The President and the First Lady were warmly received by the Government of Kenya when they arrived at the Moi International Sports Complex (MISC) for the celebrations in Kasarani, Nairobi. 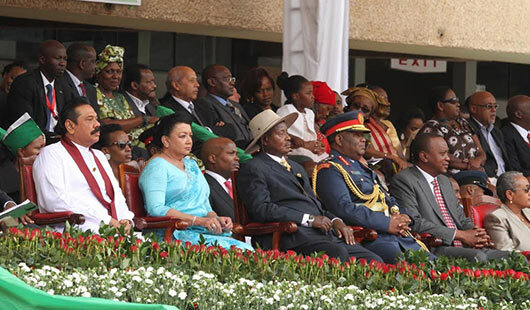 President Rajapaksa and the First Lady joined a number of other guest African leaders for the celebrations. 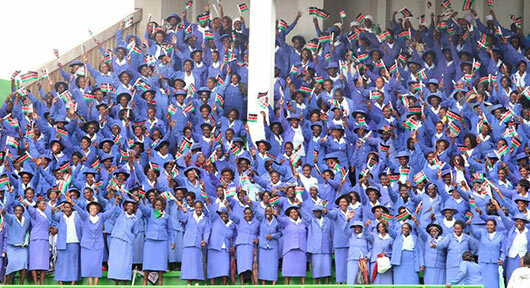 The ceremony was attended by 13 other heads of state, including the President of Nigeria Goodluck Jonathan, former President of Nigeria Olusegun Obasanjo, President of Tanzania Jakaya Kikwete, the President of Eritrea Isaias Afewerki, President of Congo Joseph Kabila and President of Malawi Joyce Banda. The former President of Kenya Mwai Kibaki and Kenya’s Deputy President William Ruto were also at the event among other dignitaries. The Independence Day festivities began on Thursday morning at Uhuru Gardens with Kenya’s President Uhuru Kenyatta hoisting the national flag and planting a commemorative tree. President Kenyatta also marked the anniversary with song and dance. Guests were also treated to a 21-gun salute and an air force fly-past. Kenya’s independence movement got its footing in 1942 when members of the Kikuyu, Embu, Meru and Kamba tribes took an oath to fight for freedom. This is what evolved into the Mau Mau Movement, and in 1952, the current Kenyan President’s father, Jomo Kenyatta was sentenced to seven years imprisonment for his involvement with the Movement and remained in prison for 10 years. Jomo Kenyatta became Kenya’s first black Prime Minister when he was released in 1962. Kenya has received independence from Britain on December 12, 1963. After Kenya gained independence Jomo became the country’s first President. 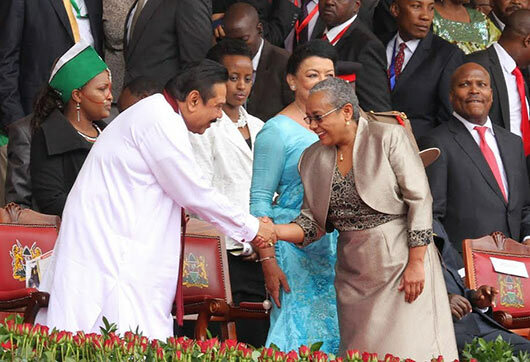 President Rajapaksa is scheduled to conduct bilateral talks with his Kenyan counterpart at the State House on Saturday. Several agreements on trade, tourism, education and cultural cooperation between the two countries will be signed at this occasion. President Rajapaksa is also scheduled to visit the African headquarters of the United Nations in Nairobi city during his tour. This is the largest office of the UN in a developing country. The Sri Lankan President is also scheduled to conduct talks with the directress of the institute Mrs. Saale Work Sevde and also with heads of the Habitat institute of the UN environment programme centred in Nairobi. President Rajapaksa will also attend the Sri Lankan Business Forum and will also address the Kenyan business community. He will also take part in the 10th anniversary celebrations of the Private Sector Forum of Kenya. This is the second time, President Mahinda Rajapaksa touring in Kenya. The President is accompanied by first lady Shiranthi Rajapaksa, Ministers Prof. G.L Peiris, Geethanjana Gunawardena, Chief Minister of Uva Province Shashindra Rajapaksa, Parliamentarian Sajin Vass Gunawardena, Secretary to the President Lalith Weeratunga and some senior officials and the members of the Sri Lankan business community.